For a long time now, there’s been an argument that DC and Warner Bros. have been making better animated films than live-action films. It seems Teen Titans GO! To The Movies, DC’s latest animated superhero comedy movie which takes aim at some of the well-worn tropes of the superhero genre, might continue that trend. Based on the few reactions on Twitter, the family-friendly film, which sees Robin, Beast Boy, Raven, Cyborg, and Starfire (the sidekick B squad of the Justice League roster) making the big jump from the small screen to the big screen, is hilarious and fun. Could this be the best superhero animated film of the year? Will it be as good as The LEGO Batman Movie and Incredibles 2? Given the popularity of the franchise and the positive reviews, the new movie has a lot of potential. Here is your chance to find out for yourself. Fortress of Solitude will be hosting an early screening of this very special animated film before its release date on the 27th July 2018. If you’re up for the adventure and silly fun, you and a partner could experience Teen Titans GO! To The Movies on the big screen before anyone else. 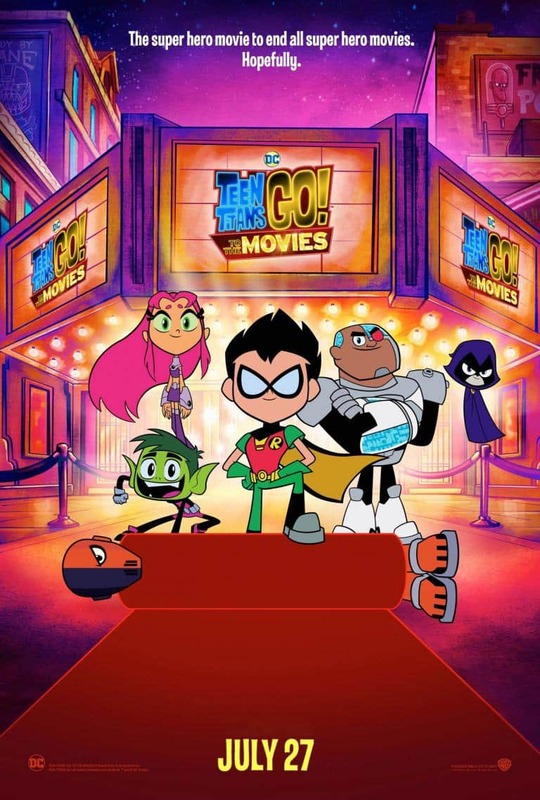 Teen Titans Go To The Movies ruled, but that’s not really a surprise. There’s a protracted Challengers of the Unknown joke that had me rolling. Teen Titans Go! To the Movies is super fun. It’s very kiddie but it’s funny, the superhero subversion is clever, the cameos rule and it goes way further than I expected. The synopsis reads: It seems to the Teens that all the major superheroes out there are starring in their own movies—everyone but the Teen Titans, that is! De facto leader Robin is determined to remedy the situation and be seen as a star instead of a sidekick. If only they could get the hottest Hollywood film director to notice them. With a few madcap ideas and a song in their heart, the Teen Titans head to Tinsel Town, certain to pull off their dream. But, when the group is radically misdirected by a serious supervillain and his maniacal plan to take over the Earth, things really go awry. The team finds their friendship and their fighting spirit failing, putting the very fate of the Teen Titans themselves on the line! Directed by Aaron Horvath and Peter Rida Michail, the film features the voice talents of Greg Cipes as Beast Boy, Scott Menville as Robin, Khary Payton as Cyborg, Tara Strong as Raven, Hyden Walch as Starfire, Will Arnett as Slade Wilson and Kristen Bell as Jade. Since everyone at DC is getting their own movie, these little heroes want in on the fun too. Fair is fair, right? “If Aquaman can get a movie, anyone can,” the Teen Titans GO! To The Movies trailer’s tongue-in-cheek narrator cheekily announces. It is also jam-packed with digs at the DCEU and DC’s pint-sized superheroes making jokes about the genre. The trailer hilariously trolls Deadpool, Green Lantern and Batman. Sure, the DCEU has been dark. But the great thing about DC is that some of their films can also take a lighter approach to some of these beloved comic book heroes. It’s great to hear that some of the jokes in Teen Titans GO! To The Movies are aimed at both kids and adults. Also, don’t forget, Oscar-winning actor Nicholas Cage voices Superman in the film. Who wouldn’t want to see and hear that? To stand a chance of winning (double tickets), all you need to do is tell us which screening you would like to attend (in the comments section below). Please use a working email address. Competition closes Tuesday, 24th July 2018. Winners will be contacted via email on this date. ©2018 Warner Bros. All Rights Reserved. Teen Titans GO! To The Movies is being released by Empire Entertainment at South African cinemas. menlyn mall pretoria I would love to view the Teen Titans GO! with my daughter she love the titans and the movie will be awesome. My 14 year old would love me for EVER if I got tickets the the Mall of Africa screening! Mall of Africa is a One hour drive from where I live, still worth it! SO MALL OF AFRICA! Cavendish Square #Teen Titans Go! Ster Kinekor!